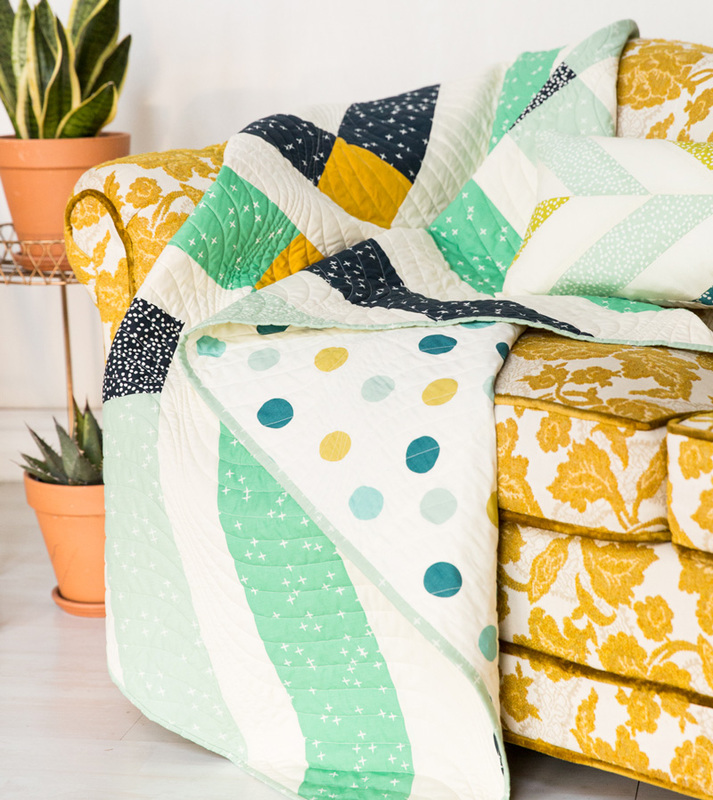 Before naming this quilt Retro Plaid, I first called it Tiny Tartan (something you should know about me – I LOVE alliteration. It makes my heart skip a beat! If Suzanne Summers wasn’t already taken, I would seriously consider a legal change.). This was too big of a deal for me to get it wrong. Future quilts were depending on it! “Dear Google, what is the difference between Tartan and Plaid?” And oye! You would not believe the amount of contradictory information out there related to this question. At one point I was on a Scottish website about to buy a purple kilt before I realized, “Scrappy doesn’t even like purple!” aaaack! Basically, before the geometry part he said that all plaids and tartans are comprised of stripes that meet at a 90-degree angle. With tartans, the pattern on the stripes running vertically is exactly duplicated on the horizontal axis too...so the matching pattern on both sides will create a grid. Whaaaat?? So thanks for noth’n, Ralph. I still wasn’t 100% sure about my quilt, so I tabled the sketch and moved on. 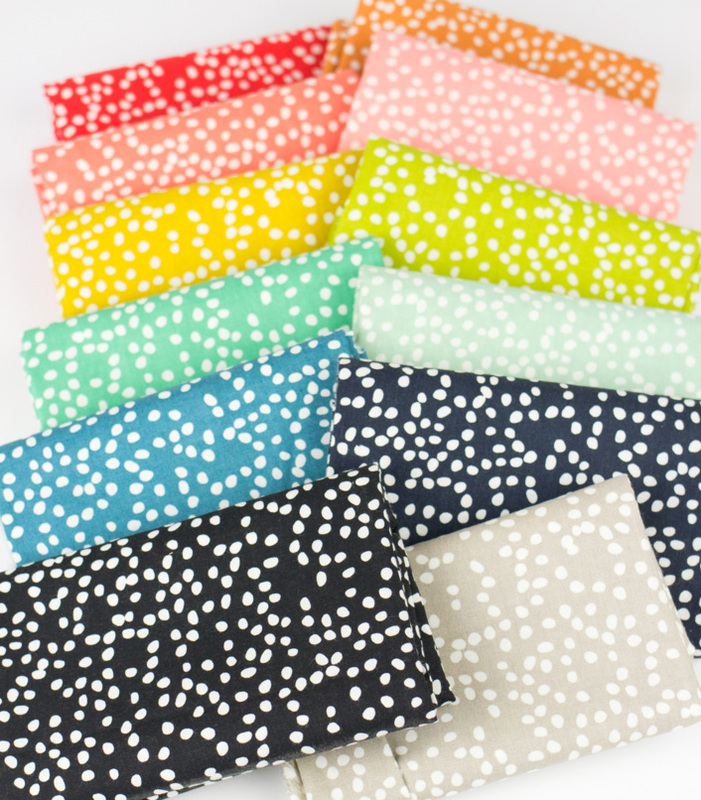 THEN I saw these fabrics….ooooohhhhh aaahhhhhhh…. and I was like, forget that tartan baby! We are going to make this HUGE and RETRO! I never did conclude the difference between plaid and tartan, so if you know, please tell me. In the meantime, I better stick to Mr. Lauren’s words and call everything plaid...because not all plaids are tartan. The math on this quilt took me a bit of time to initially figure out, but that's not totally surprising after hearing my response to geometry. At one point I even tried to use the Pythagorean Theorem! haha oh funny times. Yes, so that obviously failed. Essentially, this design is four triangles built up by sewing strips of fabric to each straight edge. In the end the four units created are sewn together with white sashing as seen in the video above. Eazy Peezy! 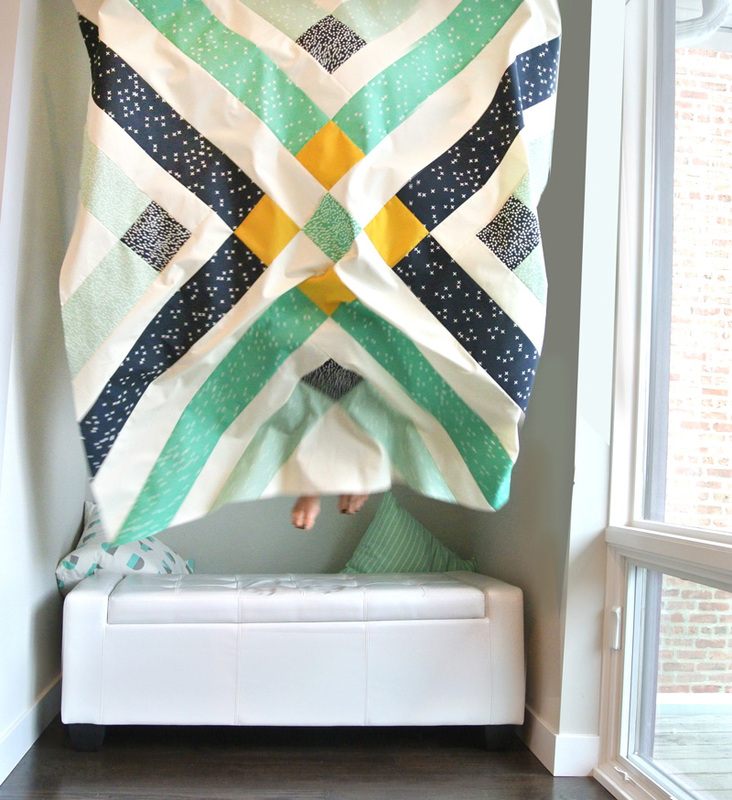 Since the quilt top did sew together so much faster than I thought, I had some extra time on my hands – so I spent it wisely by photographing myself jumping from higher and higher locations in my house while holding this quilt. Just figuring out the timer on my camera took about 20 minutes, so I'd say that was an hour VERY well spent. To create the four base triangles you start with a square and slice it in half from corner to corner diagonally – creating a bias edge. A bias edge is super stretchy and easy to warp out of shape because fabric is made from threads criss-crossing each other vertically and horizontally. By slicing those threads on a 45-degree angle, it cuts through the fabric grain and causes those threads to be less secure. 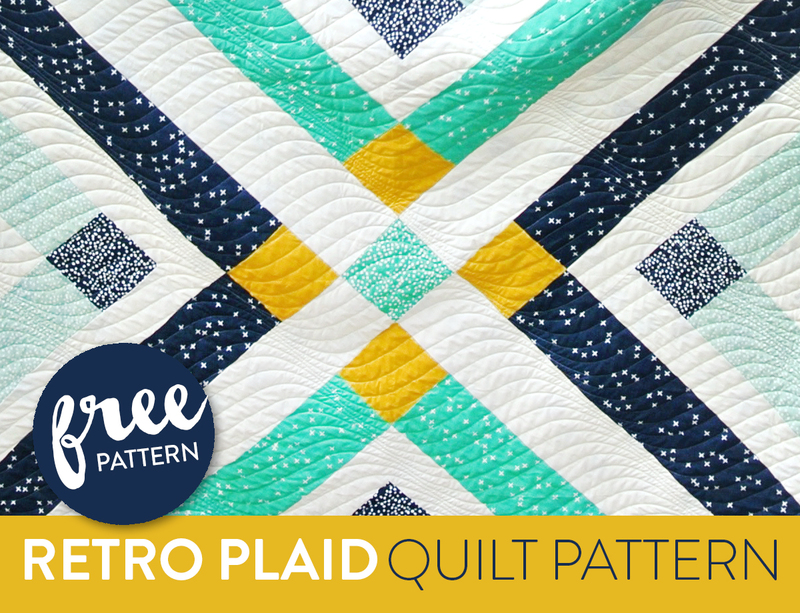 The point to saying all of that is that the triangles that will act as the base to the four units creating the Retro Plaid pattern have bias edges and need to be handled with care so as not to stretch and warp them – thus warping the entire quilt. New quilters, don’t be scared! As long as you are not tugging and pulling the bias edges you will be fine. Also, always pin fabric together so it doesn’t stretch while being pulled through the sewing machine. Do not trim the final sashing (the final two pieces that connect the four units – see video) until the ENTIRE quit is sewn together. I mention this in the pattern, but it’s important enough that I want to mention it again. If you square up the edges of the sashing before the two halves of the quilt are sewn together, you will trim too much and one whole side of the quilt will be smaller than the other. ​﻿Here﻿ is the link to the FREE Retro Plaid PDF download. If you are on Instagram, use the hashtag #RetroPlaidQuilt so we can all see your beautiful creation! Enjoy! Your blog is so nice – happy to have found it! I really love your color choices! Enjoyed reading about tartans and plaids, I had no idea! Thank you for the pattern, definitely in my queue now. I love your blog! 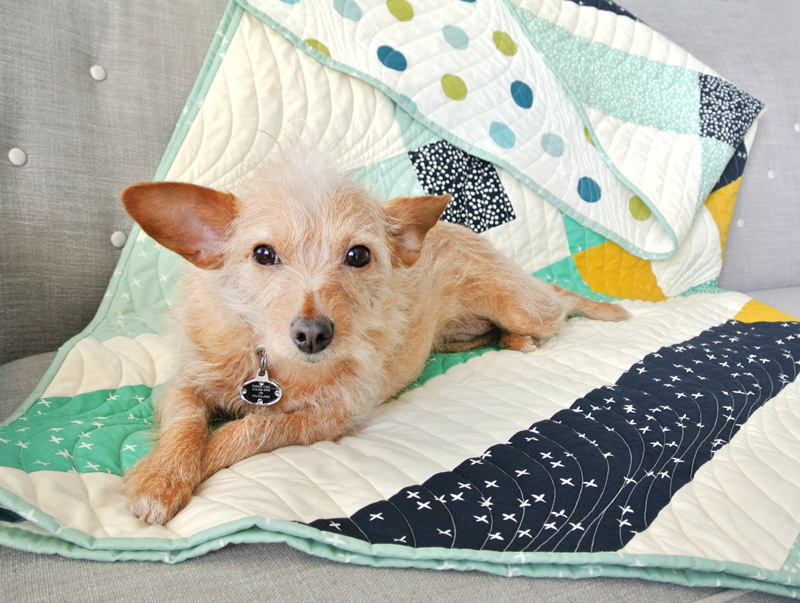 thanks so much for the pattern – your quilt is beautiful ! big, bright, bold – it’s an awesome pattern! What are the dimensions for this quilt? Love the pattern. Would it be possible to increase the size to a queen 60X80 without distorting the pattern? Your thoughts. 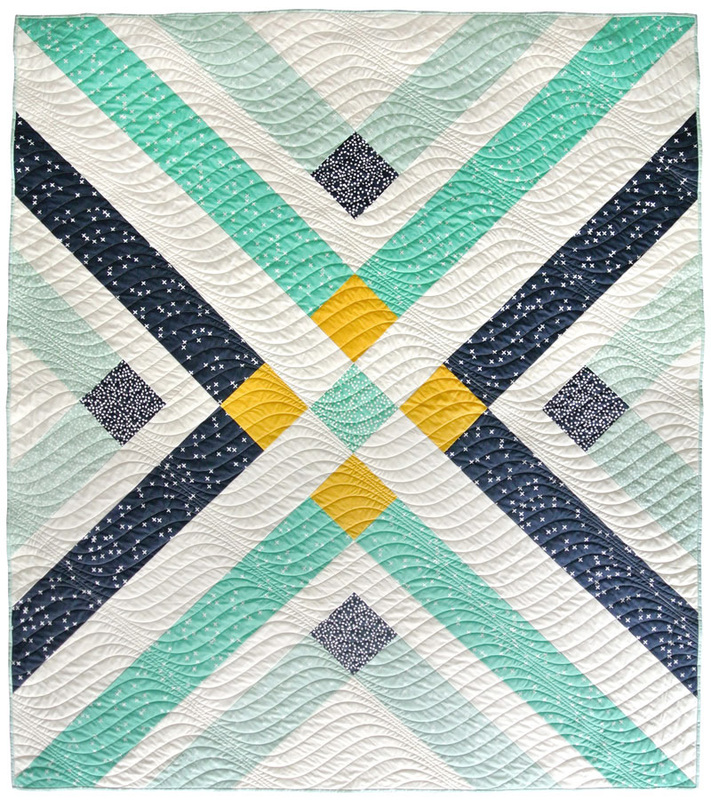 Love the pattern and the quilting design is New! Thanks for sharing! Do you know how i would adjust this to crib size? You create beautiful quilts! I was going to ask the same thing. This seems like a great pattern for a few friends of mine who are waiting for the gender reveal at birth. Trying to find something that would be neutral but fun! I would love to do it in queen size. Do you think making the pieces bigger would get me in trouble? Suzy, I’ve been looking at this pattern for awhile but have a question about the fabrics. It appears more fabric colors are used in the quilt top picture (I count 7) but only 5 are listed in the directions. Can you help me with this? I want to make sure I get it right bc I love it just the way it is. Thanks. You’re totally right. 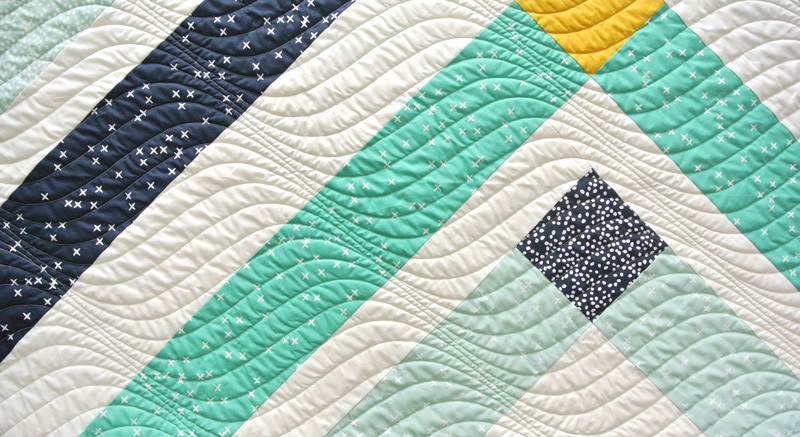 This quilt can be made using the fabrics listed in the pattern, or if you would like to make it exactly like the picture, add Firefly Dots Dusk (the dark navy squares), Firefly Dots Pond (center square) and Wink Mint (4 – 5 1/2” x 20 1/2” strips). The way I understand tartan and plaid is similar to squares and rectangles. All squares are rectangles but not all rectangles are square (geometry for you). Tartans have the exact same pattern each direction. Plaids can have different colors/lines/widths/ running on each way. I love this pattern and your blog. So happy I found both! Whenever I have to cut a square on the bias, like in this pattern, before cutting it I iron some feather-weight stabilizer on the back – then I don’t have to worry about it stretching out of shape as I work with it. Keep the modern quilts coming! Brilliant!! Thank you for sharing that tip! Instead of using bias edges, how big of a square would I need in order to cut in both directions diagonally thus creating straight outer edges or could the first round of “logs” be sewn to the squart then cut? I am currently cutting the pieces for this quilt and have noticed that the Firefly Dots Mint says to cut 4 strips – 5 1/2 x 14 1/5 strips. Is this correct or should I assume a typo and its supposed to be 114 1/2. if not how do you cut 1/5 ???? What size backing did you use. I’m guessing the larger backing would only require 3 yards. Thanks in advance. Backing requirements are listed in the pattern. I see the yardage but not the width. Is it for 44″? 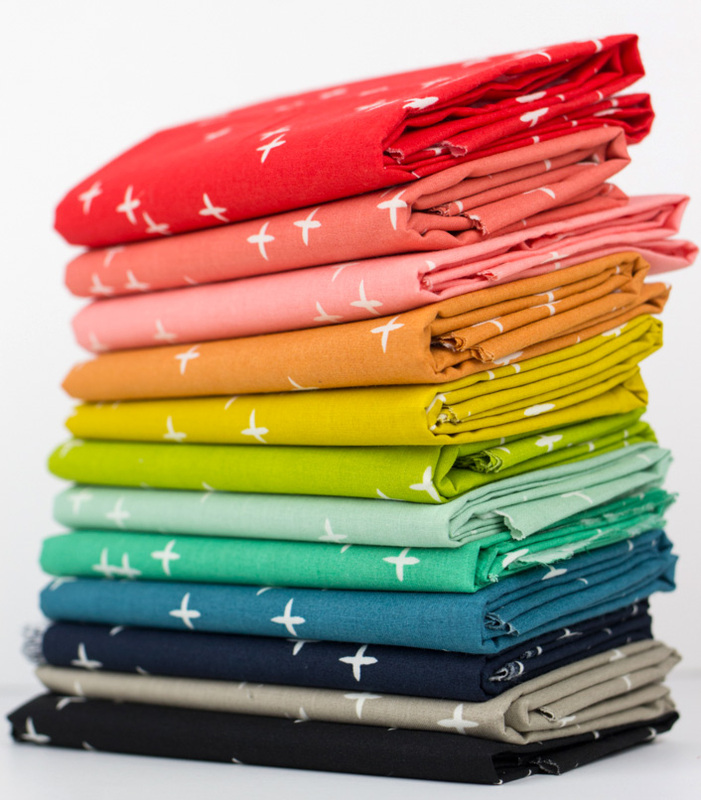 My patterns assume that you’re using regular quilt-weight cotton, which is typically 42″ wide. Sometimes it is as wide as 44″ depending on who manufactures it. Thank you!! <3 Sugar pop is next on my list. Wish me luck! Thanks for your response and so much for the free pattern. I am trying to purchase backing as we speak and I am a super newbie.